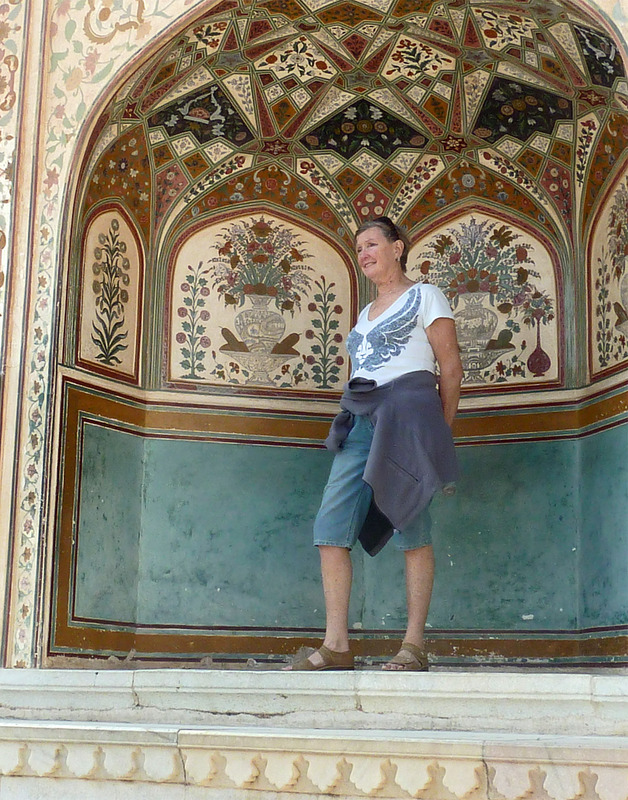 Jaipur was a new town founded down in the plain. 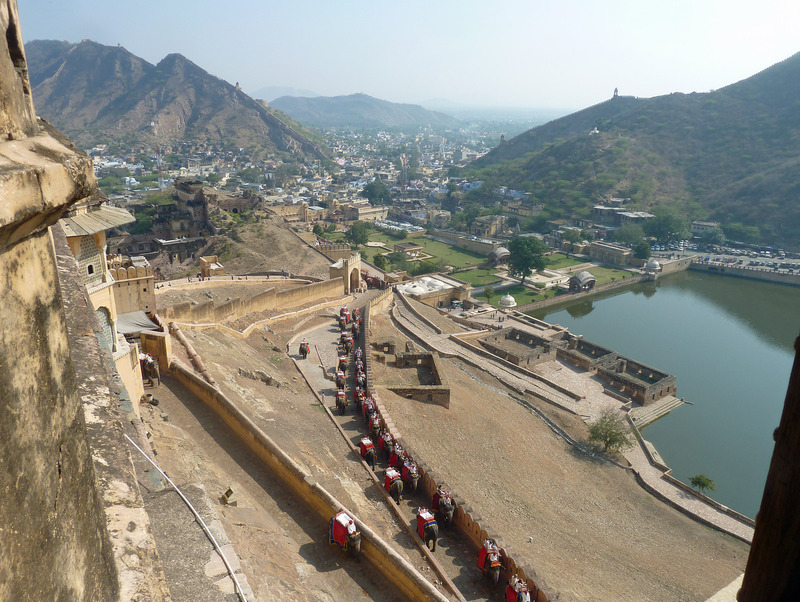 Its predecessor was the hillfort town of Amber Fort. 8 miles to the north. 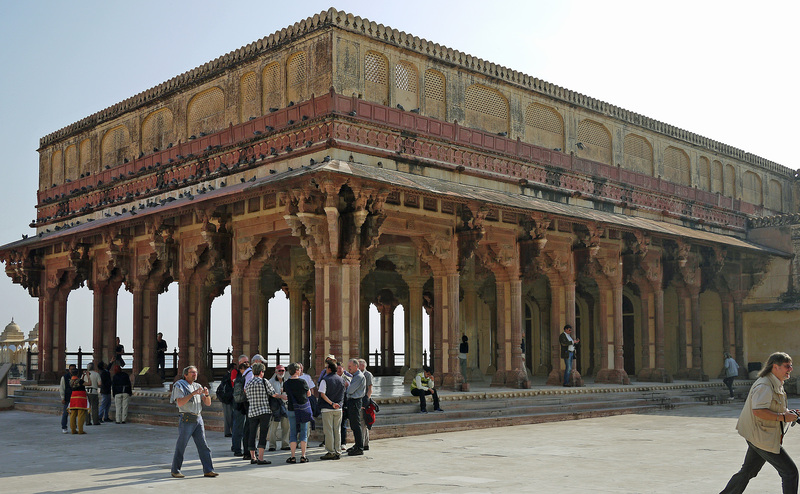 Amber remained a major palace of the Rajput kings, and is perhaps the most spectacular of the sites in Jaipur. 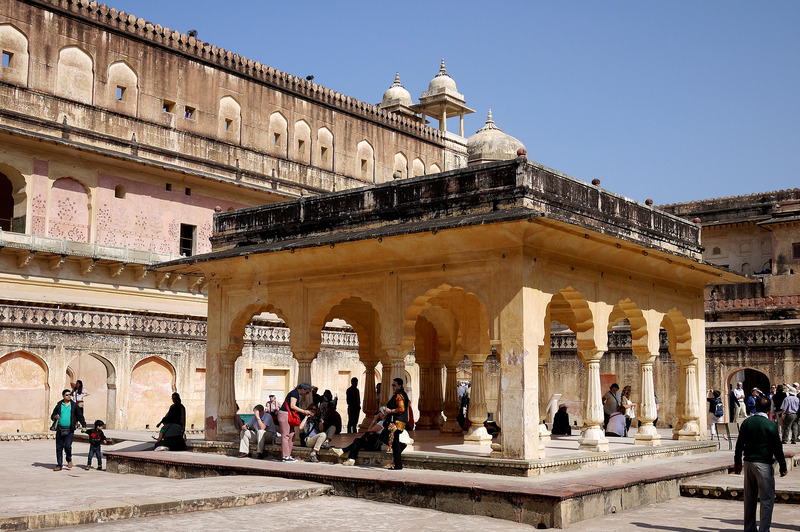 A fort was originally established in the 11th century, but the main fort was established in 1592 by Man Singh, which still forms the innermost, rather austere, part of the Palace. 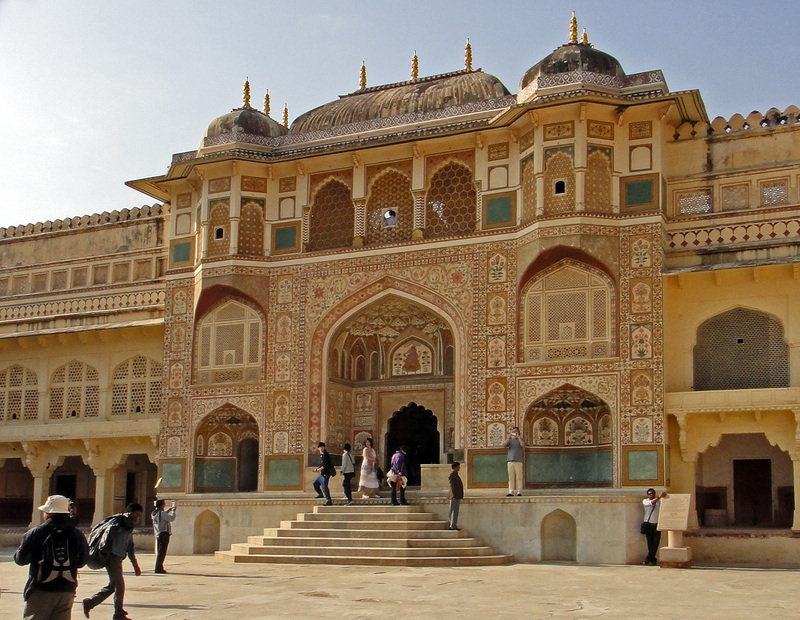 But it is the buildings added by Jai Singh during his long reign from 1621 to 1667 that form the most spectacular parts of the Palace. 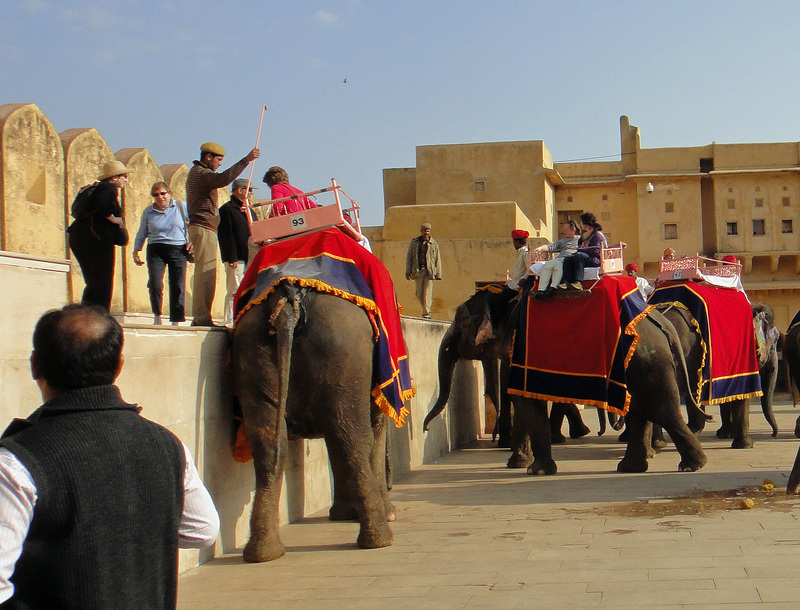 Tourists are brought to the lower part of the town from whence there are two possible ways to the main palace: either by jeep or by elephant. 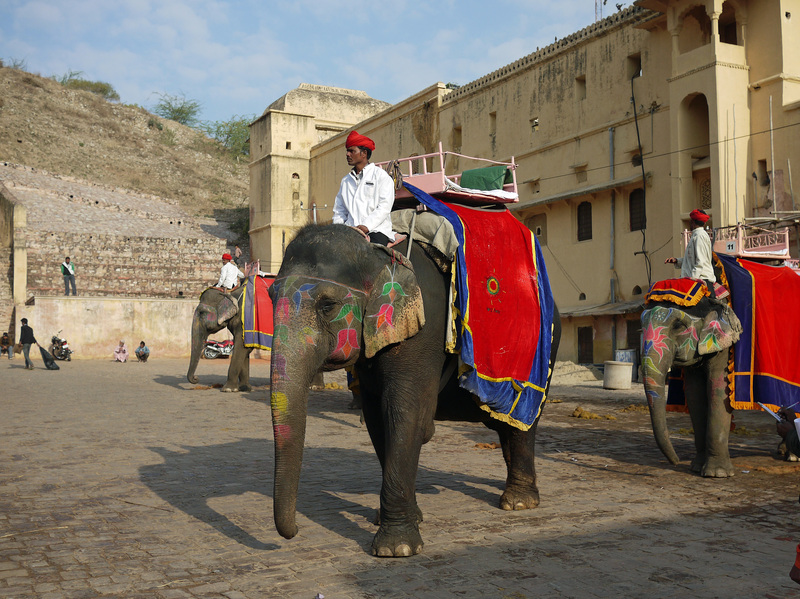 Over 80 elephants are kept at the Fort and this is one of the best places for those who wish to take an elephant ride in India. We preferred to take the jeep. 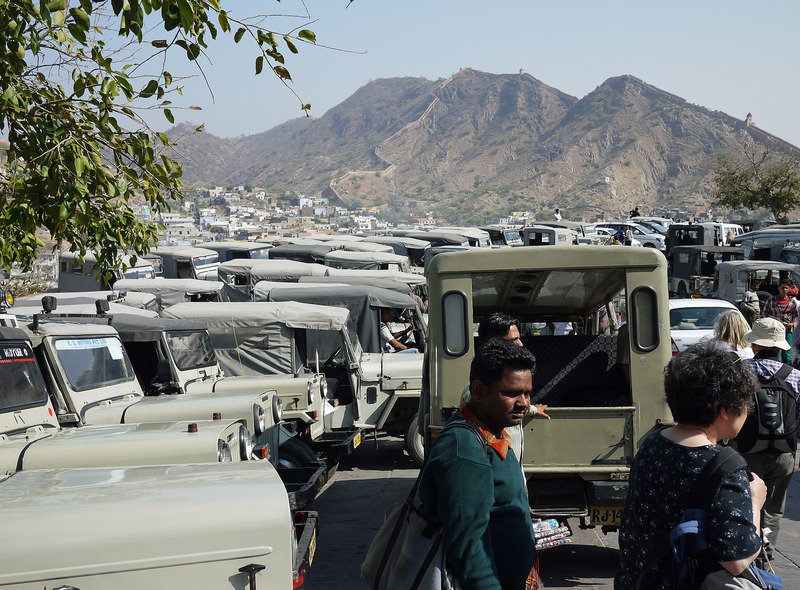 How we travelled – by jeep! 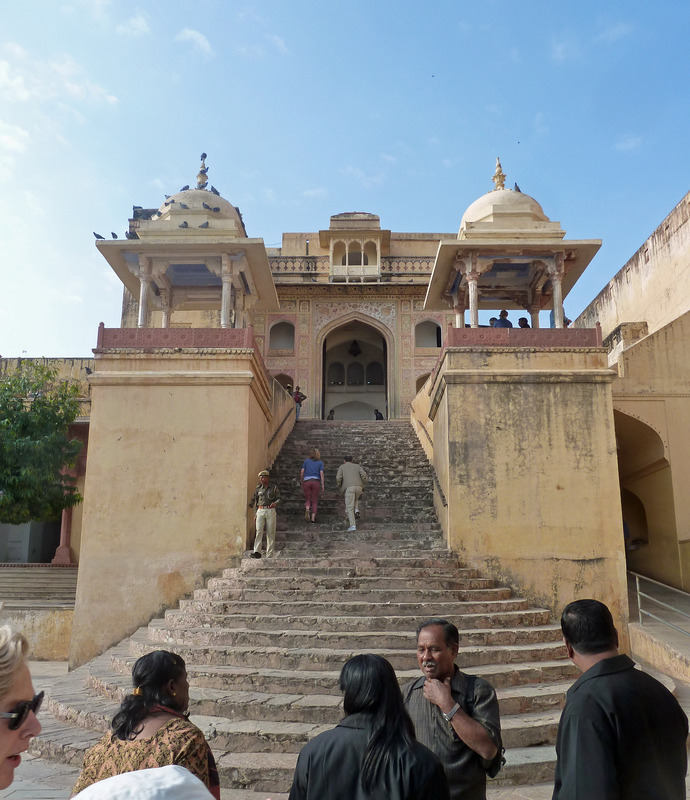 The outer courtyard was the last to be built, on the lower ground approaching the palace. 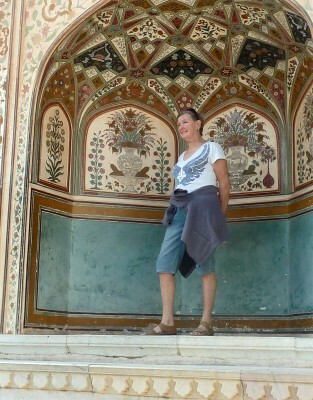 At the top is the Lion Gate or Singh Pole. 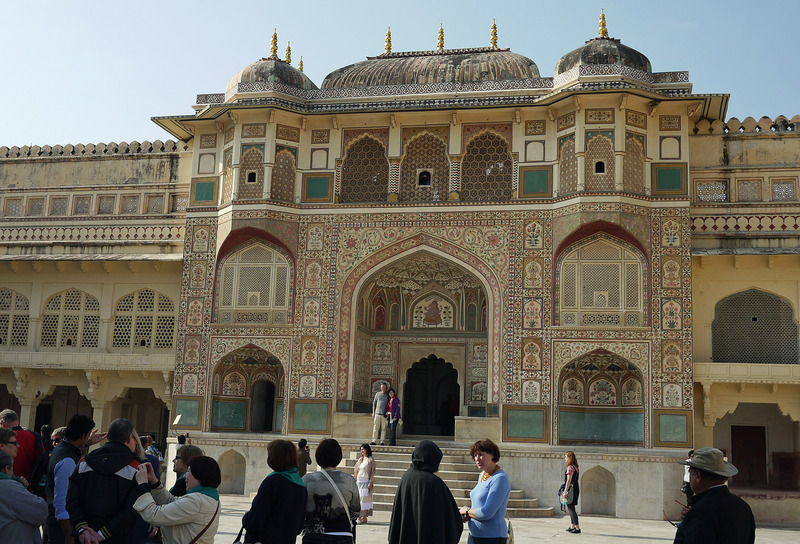 This is the most spectacular part of the Palace, the highly ornamented entrance from the outer to the middle courtyard. 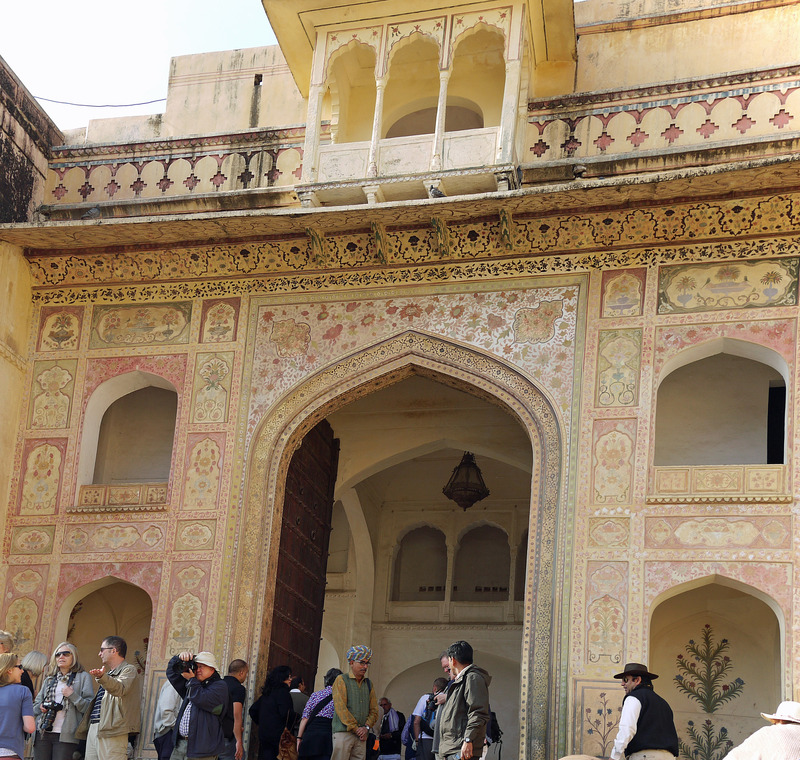 Above the gateway are the special rooms from which the ladies of the Palace could observe what was going on in the Hall of Public Audience while remaining in purdah. 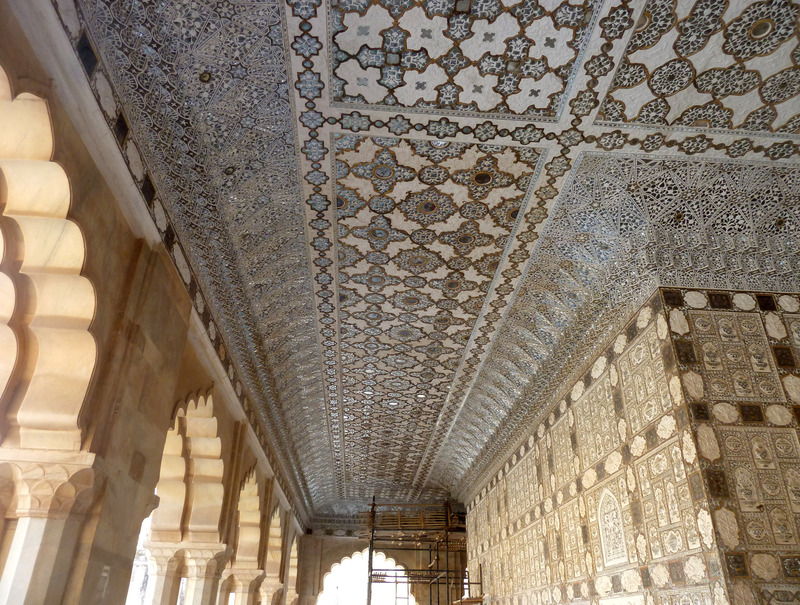 The most spectacular part of the Palace is the Sheesh Mahal , where the rooms are highly decorated with inlaid tiles and mirrors reflecting the light everywhere. 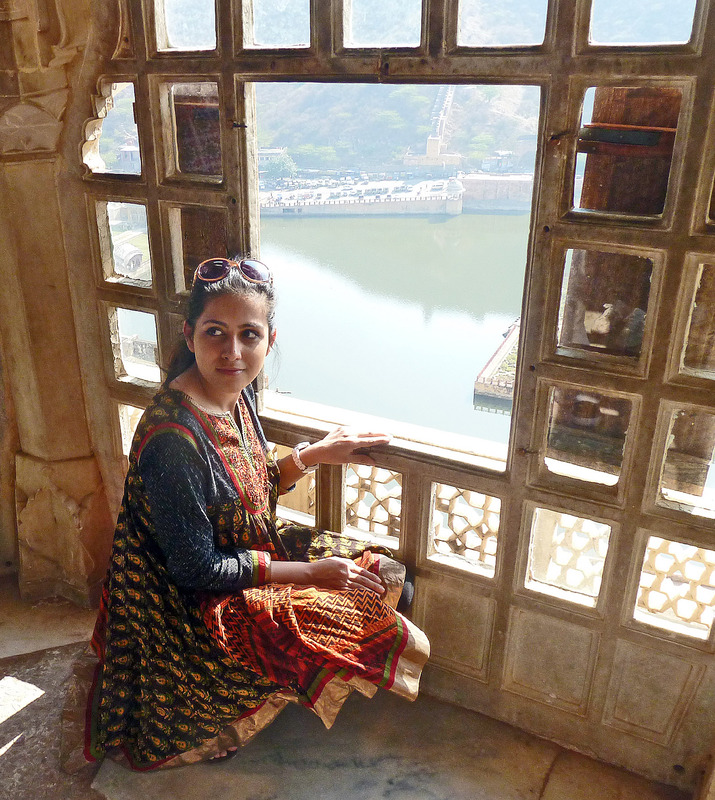 This is the highlight of the palace built by Jai Singh between 1621 and 1667. 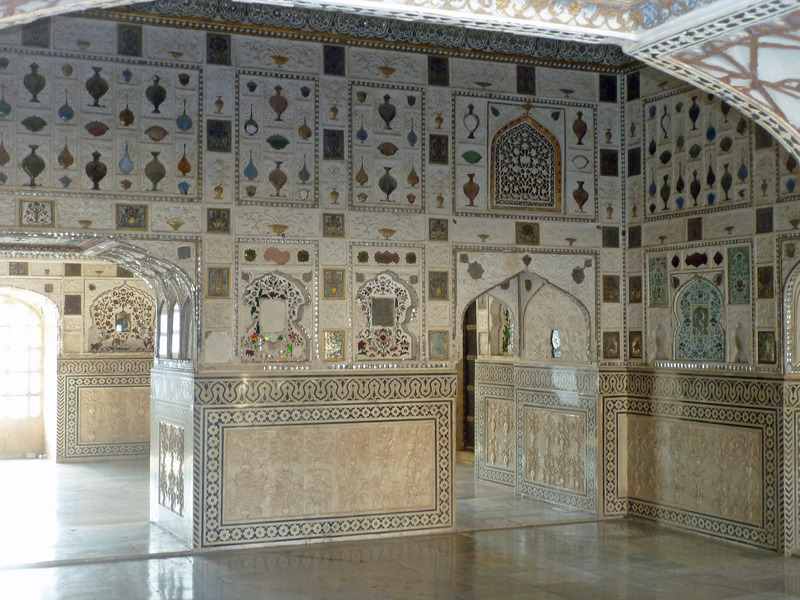 A view into the interior rooms of the Sheesh Mahal. 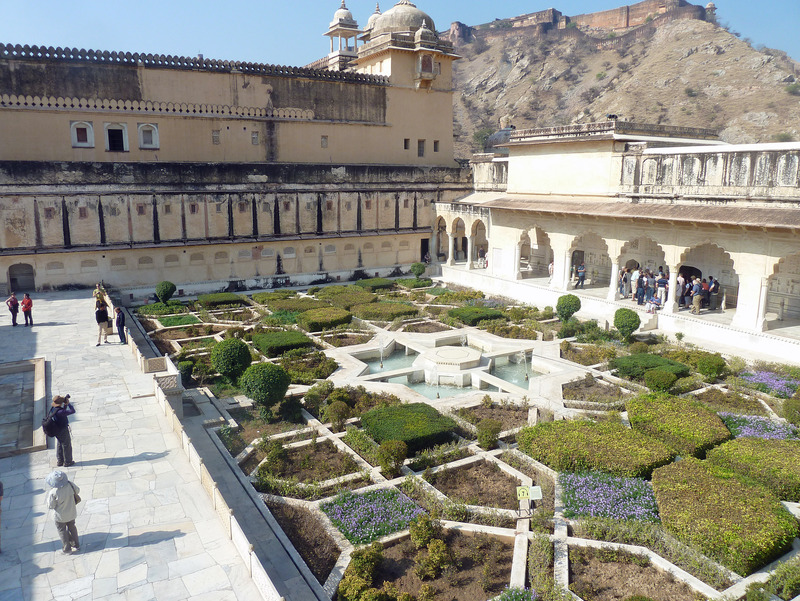 The central courtyard is occupied by the Aram Bagh, the pleasure garden. From here a series of hidden passages lead through into the oldest part of the place built 50 years earlier by Man Singh. 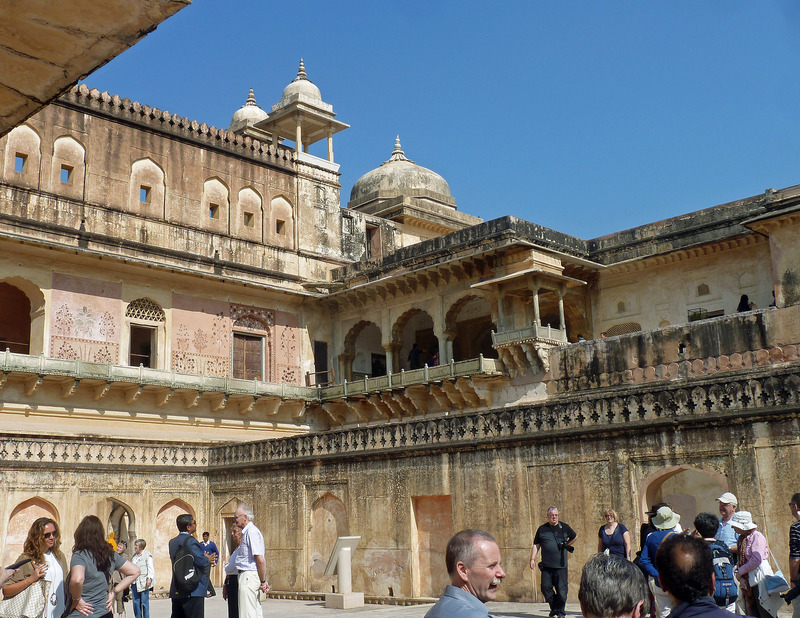 This is the inner courtyard of the palace, the part originally built by Man Singh in around 1592. At the centre is this Baradari pavilion which was once the meeting area of the maharanis, shrouded from men’s eyes by flowing curtains. The view from the magic casement . . .